Yes, Virginia, NORAD's 'Santa Tracker' Is On : The Two-Way Critics — some might say Grinches — don't like the defense command's annual online effort to "track" Santa's travels. But for those who wish to follow his journey, the high-tech tool is up and running. The view Friday morning on NORAD's "Santa Tracker." Some critics — perhaps others would say Grinches? 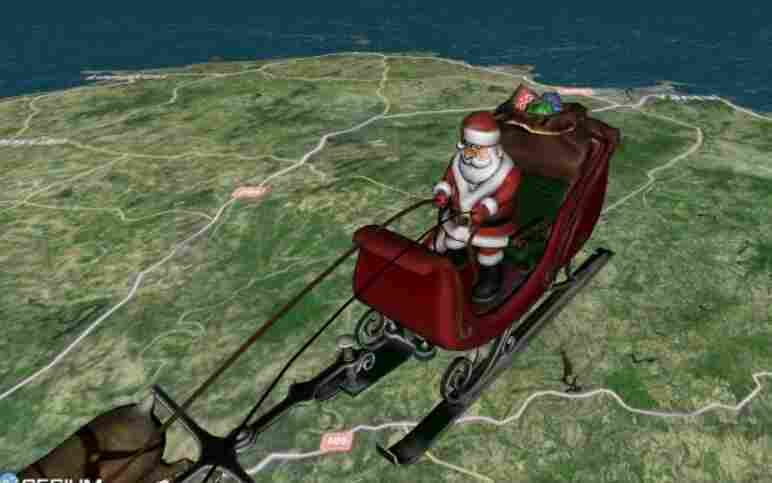 — don't like the North American Aerospace Defense Command's annual online "Santa Tracker." At WBUR, author Ethan Gilsdorf writes that "real-time digital imagery of Santa and his route, or calculations of the loot he's delivered, take the imagination out of Christmas." An advocacy group, the Campaign for a Commercial Free Childhood, is particularly critical of a promotional video NORAD produced that shows Santa being tracked by fighter jets and all sorts of other military gear. It's "a back-door way" to market the military to children, the group's spokesman says. We suspect that the tracker's fans will say "bah humbug" to all that. We'll let others debate the Santa Tracker's merits. We just want to make sure that if you or your children are interested, the tracker is here. "How many people support this effort, and are they active duty military personnel? "More than 1,250 Canadian and American uniformed personnel and DOD civilians volunteer their time on December 24th to answer the thousands of phone calls and emails that flood in from around the world. In addition to the support provided by our corporate contributors to make this program possible, NORAD has two lead project officers who manage the program. "How much money is spent on this project? "The NORAD Tracks Santa program is made possible by volunteers and through the generous support of corporate licensees who bear virtually all of the costs." Oh, and about our "Virginia" reference in the headline. Most readers will know what we're talking about. For those who don't, and for those who might enjoy re-reading it, here's a link to the Newseum's posting of the New York Sun's 1897 editorial known as "Yes, Virginia, there is a Santa Claus."